Although the green toad (Bufo viridis) can today be found all over Central Europe, Asia, Africa, and even on the Balearic Islands, it became extinct in the Iberian Peninsula at the end of the Early Pleistocene (1.1 million years ago). This has been demonstrated by an international research study, with Spanish participation, which has discovered the first green frog fossil in Murcia. 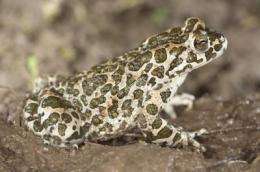 Analysis of fossils found in the Cueva Victoria deposit in Cartagena (Murcia), has for the first time confirmed the presence of the green toad (Bufo viridis) in south eastern Spain at the end of the Early Pleistocene (more than 1.1 million years ago), in the provinces of Granada, Murcia and Castellón. "Around 500 fossilised bones document the entire skeleton of the green toad, and provide key osteological clues that mean they can be unequivocally attributed to this species", Hugues-Alexandre Blain, one of the authors of the study and a researcher in the Prehistory Department at the Rovira i Virgili University (URV) in Tarragona, tells SINC. The study, which has been published in Comptes Rendus Palevol, shows that at this time the amphibian belonged to a different subspecies than the green toads of today. Changes in the climate and landscape, "which have taken place frequently over the past two million years", could be the reason for them having become locally extinct. Nowadays, B. viridis is distributed extensively throughout Eurasia and northern Africa, but until now its presence had never been demonstrated in the Iberian Peninsula. "Although the peninsula has favourable ecological conditions, the species is strangely absent", the expert says. The south western limit of its current range in Europe is the border between Italy and France. In Spain, it is only found in the Balearic Islands, "where it is thought to have arrived recently, possibly having been introduced by the Phoenicians from northern Africa", says Blain. Why did it disappear in the Iberian Peninsula? There are various theories as to the causes that led to the green toad disappearing from the Peninsula during the Pleistocene. "Growing climate changes and in particular the cold period seen around one million years ago could be possible explanations", the scientist explains. However, pressure from the natterjack toad (Bufo calamita), "which is stronger and more competitive", may have displaced the green toad and "made it locally extinct", leaving it "trapped" in south eastern Spain. The expert says that "we will only be able to find out what really caused the local extinction of B. viridis by carrying out studies on more deposits, covering a more extensive geographical area and longer time period". The green toad belongs to the family Bufonidae, but its ancestor is unknown. "Molecular studies suggest that green toads had an ancestor in Central Asia, but the oldest fossil record found to date is from the Early Miocene (more than 20 million years ago) in France and Spain", explains Blain. In Spain, the closest living toad relative of B. viridis is the natterjack toad, which is found all the way to Ukraine. In Europe, "Bufo priscus could be a good candidate for the title of the European ancestor of B. viridis", says the scientist, who believes it is necessary to carry out a "serious review of all the fossils attributed to this group in Europe, Africa and Asia".